Sean Sarantos lost one battle, and he was stabbed in the face. 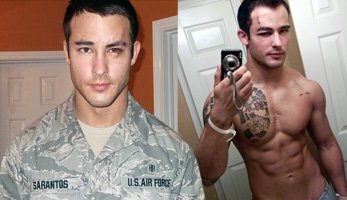 But this active duty U.S. Airman adapted and rebuilt his body despite that and other setbacks. Sean Sarantos seems to have it all. He is a successful fitness model who works as a physical and occupational therapist. CytoSport has signed him, as has Team Bodybuilding.com. Still, his career is only beginning. The future looks bright. He's also lucky to be alive. He was stabbed in the morning of October 30, 2010. He nearly lost an eye and his life. It was a case of mistaken identity, but tell that to your body as a blade moves through your flesh. An injury complicates your entire life; rehab defines it. It's easy to just give in and live with the pain. It's so much harder to get up and work through it, to overcome. Sean asks: "Am I going to let it break me down or am I going to be stronger for it?" He affirms the latter. He felt the keen edge, but through specific training and injury avoidance, he recovered. I'm injured; I'm not going to be able to do the things I'm used to. I don't know exactly what I can do, but I'm not going to let it slow me down. I'm going to go ahead and do the best I can with what I can do. Where am I going to grow from this? Maybe I'm not going to be able to be 100 percent, ever again. How is that going to affect me? See how Sean planned a routine around his limitations and eventually worked his way out of them. Soldiers adapt to scenarios in the field. That's true in the gym too. You may not face a recovery as brutal as Sean's, but your own obstacles threaten your physique in similar ways. Sean doesn't recede one inch when pain and doubt push against him. Follow his lead, and never say die. Follow his program, and you'll live your life to the fullest. Sean Sarantos is a Cytosport athlete, but even though he takes their products for good reason, he still needs whole foods to complete his plan. Sean sticks with his diet for the entire year, so he doesn't need to switch on and off. This stability helped him create a physique and keep it. Since Sean Sarantos and his body don't always agree with a set workout schedule, he bases his routines off how his body feels each day.